Receiving Communion for the first time is often commemorated with gifts decorated with symbols of wheat and chalices. Of the seven sacraments -- including baptism, marriage, confirmation and confession -- First Holy Communion is the most important to Catholics. Catholics believe that Jesus is truly present in the bread and wine of Communion, so when Catholics receive Communion for the first time, they believe they are physically receiving Jesus. 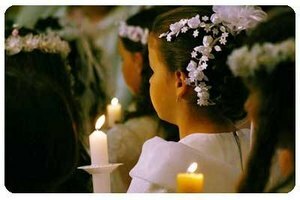 As with any special occasion, people participating in the sacrament of First Holy Communion are often given gifts to commemorate the occasion. Generally, children receive First Holy Communion around age seven. 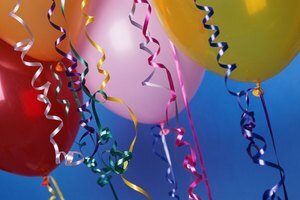 When choosing a gift for First Holy Communion, one of the first things to consider is the color. In the Catholic Church, colors are key in expressing the tone of the season or occasion. For First Holy Communion, white and gold are the most popular colors for gifts. White symbolizes purity, innocence, joy and virtue. Visitors who attend a First Holy Communion service will notice the girls in white dresses with veils, symbolizing their purity. Silver can sometimes be used as an alternative to white. Gold symbolizes majesty, joy and celebration and the presence of God. Personalized or heirloom gifts are a great choice for First Communion. 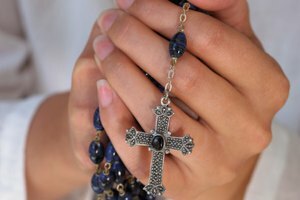 Rosaries, crosses, photo frames, candles and small figurines and religiously themed jewelry are all items that can be personalized to commemorate the occasion. 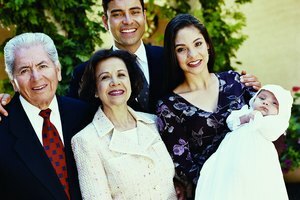 The ability to pass items down to future generations is something to keep in mind when choosing a gift. Often these special items are saved for many years as keepsakes of First Holy Communion. Many symbols are associated with First Communion. Bread, a chalice and crosses with a chalice in front are commonly seen with traditional First Communion gifts. Bunches of grapes and stalks of wheat, symbolizing the bread and wine, often adorn First Communion gifts of picture frames, small purses, or handkerchiefs and figurines. Books that further explain Catholic beliefs and practices can be perfect gifts for first communion. Bibles, Mass books and books about the Catholic Church can help a person understand the sacraments of the church and what to expect now that he has received First Communion. When selecting a book, make sure it is written for an appropriate age level. People who come into the Catholic church at a later age may appreciate more cerebral reading materials. Stakelum, Laura. "Catholic First Communion Gifts." 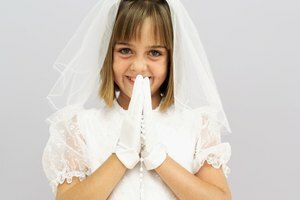 Synonym, https://classroom.synonym.com/catholic-first-communion-gifts-12086445.html. 29 September 2017.